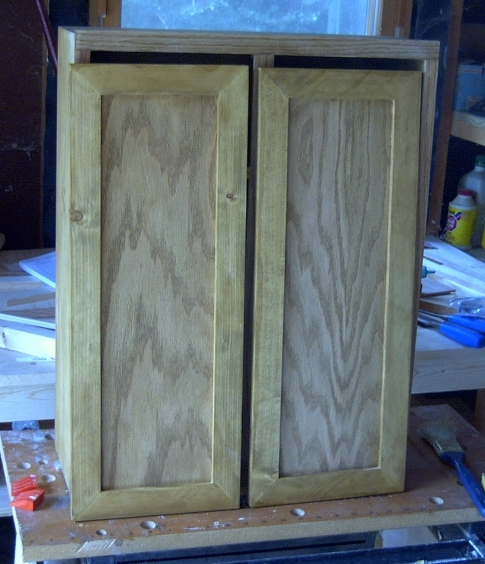 Here’s the finished cabinet with the doors open, allowing a nice view of the inner side of the doors and the shelves. The hinges are not flush with the door surface but are screwed directly to the inside. All the inner surfaces got three coats of varnish to help preserve the wood from the humidity expected in the bathroom. Here’s the finished product with the doors installed. You can see some of the table saw blade marks on the left hand door at the bottom where I ripped the board in half to get the thickness I needed. Even though I sanded the wood smooth the marks still showed up after I stained the board. They add a little character to the cabinet! 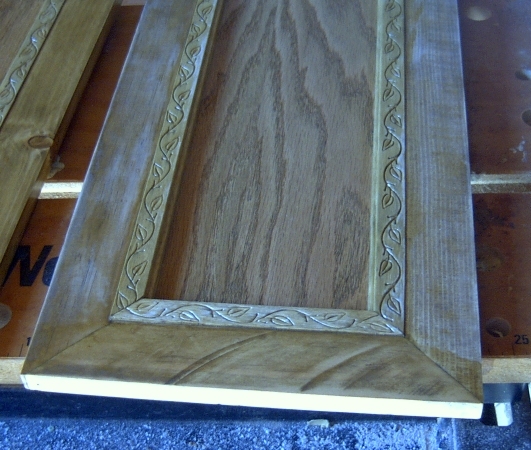 Once I’d finished the doors they looked a little plain to me. I decided to add some molding to the inner edge of the frame, and used a narrow ivy leaf pattern similar to what I used on Toybox #3. It was too thick, however, so I had to trim off about 1/4″ of its width and then rip the thickness in half in order to get it to fit properly. The final molding is only 1/2″ wide, and since all the cutting was done on my table saw getting it to that size was hazardous to say the least! To make it safer, I glued the molding to a larger piece of wood, ripped the necessary thickness off of that, then beveled it into the corners similar to the frame that borders it. 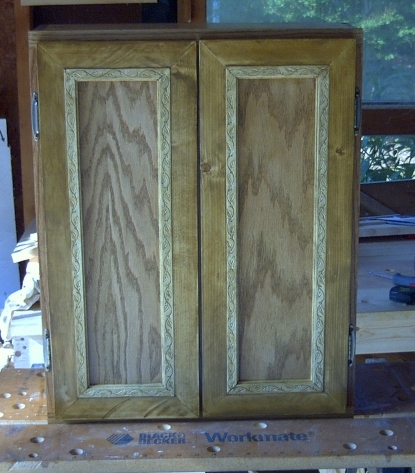 The doors are made from the same wood as the cabinet itself, but the center panel is 1/4″ oak. I set them in front of the box to make sure they would cover the openings and locate where they needed to be placed so they’d be equidistant from the edges. 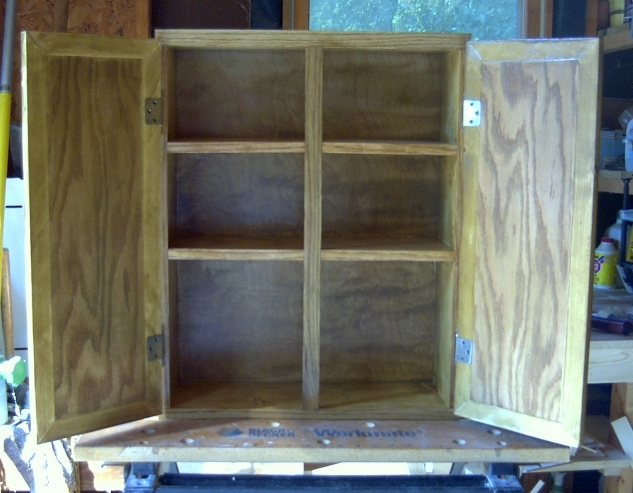 This is the basic box structure of the medicine cabinet after it was stained but before the doors were fitted. 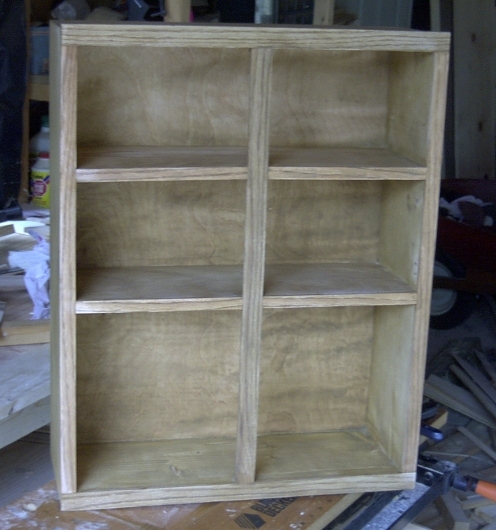 The front has 1/4″ oak facing it, and the back is red oak plywood.